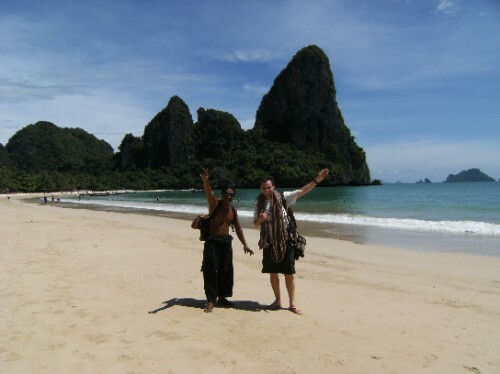 Blog from Krabi, Thailand | Where is the Love? The ferry leaving Phi Phi to Krabi was packed to the gunnels but did have seats and air conditioning so thankfully no sticking to the floor this time.A smooth crossing and we were negotiating our long tail price to the near by beach resort of Rai Lei.Not knowing if we were being ripped off or not we were soon speeding towards the beach after a short taxi transfer. On arrival at the east side of Rai Lei the beach was a little dirty so we started to walk through to the much nicer west side. It was clear that the accommodation here was slightly out with our limited budget. Thankfully we met some very friendly Danish lads who told us that on the near by beach of Hat Ton Sai you can get a concrete beach bungalow with fan for 200 Bhat (GBP 3.50).How do we get there Hannah instantly replied.Just over this hill was the response.We ok with the bags and flip flops, oh yes. We soon found out from the Danish boys that Hat Ton Sai was a Mecca for climbing buffs from all over the world, and with them being mad climbers the short walk to the beach bungalow was in fact a climb for beginners, they had assumed that with the large packs and being at Rey Lei we were also experienced climbers.Still after scrambling around the rocks with full pack and flip flops on we made it to the other side.I had a slight sweat on, not for the first time that day.Still good to their word we checked in to our very nice and clean bungalow that was perfect except no electricity until it was dark. So in this haven for climbing we thought that we better give it a go to see what all the fuss was about.We went to Wee's climbing school and that is where we met our instructor Mick. Very friendly Mick was everything you can imagine a Thai climbing instructor should be. On arrival for our afternoon lesson we found Mick lying on the floor in only Thai pants chanting ''I have no power".He then got a little flustered when he had three customers in the shop at once stomping around saying ''only me, only me, not superman''.A laid back life Mick enjoys. In fair he was excellent, really helpfull and funny and had a large emphasis on the safety aspects especially as I had his life in my hands as he kicked the lesson off by what looked like running up the wall in bare feet.Now it was our turn and Hannah and I alternated as we attempted 4 climbs of varying height and difficulty.As Mick said Hannah was very good at getting up and I was the better that getting down.Clearly the heavy weights I was lifting in NZ were not the same as pulling my frame up the vertical wall.It was fantastic fun, scary and the views superb. A great day finished off with a cold beer on the beach.As Mick and I enjoyed our beer Hannah went off to take some photos.In Hannah's absence Mick informs me sometimes he likes to come to the beach and admire the fishes, "'you know what I mean Brian, the fishes''; no idea I'm a married man was my response.Only to be met with ''married Brian not dead' and a hearty chortle. Only two nights on Ton Sai before heading to Krabi and the bus to Phang Nga. Bbolai Sorry to hear. If you have a gargae sale, gargae sale, selling to keep the children, want everything on e-bay, or even ask you, save the school or, if you could work for them.